The Baroque bow with which I recorded the Bach Suites is by Denis Bergeron of Lyon, France. It is made of snakewood, and can easily elicit the fullest realization of the violoncello piccolo's sound palette; I would go so far as to say it out-performs many excellent modern-style bows. For a modern cellist to branch into historically-informed performance of early music requires both specialized knowledge and an appropriate instrument. 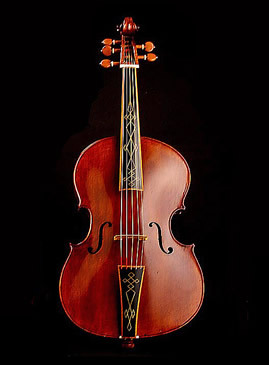 In 2004 I commissioned Warren Ellison of Jericho Center, Vermont, to build a copy of a five-stringed 1609 Brothers Amati violoncello piccolo. This ended up being the instrument on which I recorded three Bach suites for the Centaur label. Warren had only a series of black-and-white photographs to work from, and he had never built one of these little cellos before, yet he created an instrument of such striking appearance and beauty of sound that it dramatically surpassed all my expectations.